The 12-day festival of poker which made up the inaugural partypoker MILLIONS South America was a smashing success by every measure, doling out a whopping $7,000,0000 in guaranteed prize money, the largest ever in the history of poker in Latin America. The highlight of the series was easily the crowning of Martin Mathis as the first ever MILLIONS South America Main Event champion. Mathis outlasted a field of 439 entries and bested Brazilian pro Bruno Volkmann heads-up for the trophy and $873,700 USD. At least it is for Martin Mathis. The Main Event winner is an avid PP LIVE Dollar satellite player, having amassed $365,350 in winnings so far and securing a place as the current top earner on the 2018/19 PP LIVE Dollars Leaderboard. At the end of the season $1,000,000 will be shared amongst the top 100 earners, and if the current standings are anything to go by, Mathis looks in a strong position to take home the top prize of $100,000. So far Mathis has used his PP LIVE Dollars to buy in to MILLIONS South America, along with every other MILLIONS event announced this season including MILLIONS North America, MILLIONS Europe and MILLIONS World. If Mathis also uses his PP LIVE Dollars to buy in to MILLIONS Online when it’s announced in full later this year, he’ll be eligible for the MILLIONS Loyalty Reward and scoop a free MILLIONS UK 2020 Main Event Seat worth $10,300. You can find out more about PP LIVE Dollars here. Along with the MILLIONS South America Main Event winner Martin Mathis, and a rare appearance from last year’s MILLIONS Germany winner Viktor ‘Isildur1’ Blom, there was a lot to celebrate as action at the 12-day festival unfolded. Enio Bozzano outlasted the largest field of the series, 886 entries to be exact, to win the kick-off tournament, the $1,100 Rio Open $1,000,000 Guarantee for $187,200. The distinction of being one of the largest winners outside the Main Event went to Joaquin Melongo, who took down the single-day $25,000 No-Limit Hold'em for $180,000 and finished third in the $10,000 High Roller for $125,000 for a combined $305,000. Guillaume Nolet earned a cool $300,000 as the last player standing in the $10,300 High-Roller, besting a field of 97 entries and a final table which included partypoker Sponsored Pro Anatoly Filatov, 2013 World Series of Poker Main Event Champion Ryan Riess and Faraz Jaka. Other MILLIONS South America first place finishers include Ariel Celestino ($500 8-Max -$22,825), Drasko Boskovic (Bounty Hunter - $19,194), Rafael Barcia ($1,100 6-Max - $43,576), Katharina Soehren (Ladies Event - $2,075), Vladas Tamasauskas ($550 Win the Button -$15,562), Almir Reis ($1,100 Mix-Max - $14,266) and partypoker Players Panel's Patrick Leonard ($5,300 6-Max Turbo - $31,800). A tournament of firsts, MILLIONS South America also hosted the Inaugural Player Panel Q&A Forum, which was designed to give players the chance to talk to partypoker representatives openly and in person. In short, it was about giving players more of what they want. And thanks to the Player Panel, there’s a forum to find out exactly what that is. 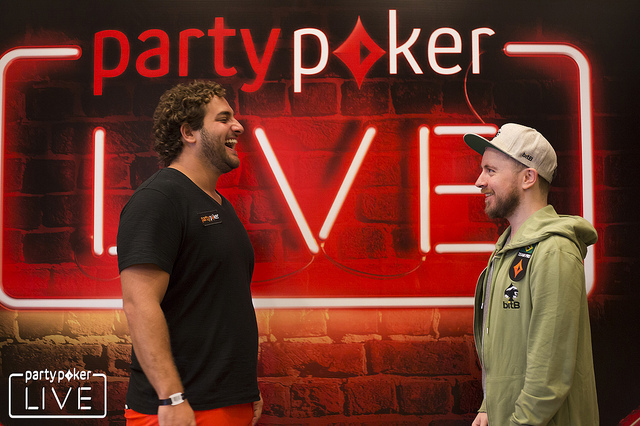 You can find out more about the partypoker Player Panel here. Alongside all the action-packed side events at MILLIONS South America was the Celebrity Show Match, which brought together the following eight great players and influencers on one table: Phil Hellmuth, Mike Sexton, Richard Dubini, Jeff Gross, Leon Tsoukernik, Renato Nomura, Alejandro 'PapoMC' Lococo and Pablo 'Duende' Ballón. And lastly we'll leave you with Jonathan Depa, who is flying on a private jet with Ben Lamb and John Cynn after his SHR win in Rio. They are on their way to the Enjoy Casino Punta Del Este trying to turn a profit on $500,000 in casino chip added value. While the dust settles on the action in Rio de Janeiro, more partypoker MILLIONS excitement is on the horizon. partypoker MILLIONS North America takes place at the Playground Poker Club in Montreal, Quebec May 21-26, 2019. If you would like to secure your seat at the next MILLIONS festival you can win your way there by playing PP LIVE Dollars satellites. They take place daily with buy-ins ranging from $11 to $1,050. You can use your winnings to pay for your event buy-ins as well as towards travel expenses like flights and hotels. Check out the latest PP LIVE Dollar satellite schedule here.